Boston is home to the world’s leading life science supercluster. This provides ample learning opportunities for the next generation of health entrepreneurs. UMass-Boston’s MBA program now offers a course allowing student to quickly develop a new health product or service. UMass-Boston alumnus and Massachusetts native Robert Schultz developed an unorthodox MBA course called MGT655 Healthcare Innovation to immerse students in Boston’s dynamic, vibrant life science ecosystem. The course culminated at UMass-Boston’s Venture Development Center (VDC) where students presented their innovations to a panel of mentors, participating in the Global Entrepreneur in Residence (GEIR) program. Through its GEIR program, the VDC helps international entrepreneurs launch high growth companies in Massachusetts and the United States. The GEIR program provides an innovative and legal pathway to establish, attract and retain world-class entrepreneurs here in the United States. Earlier in his career Schultz worked at successful software startups and yet felt a lack of connection to the real world. He was inspired by the cystic fibrosis community and founded a startup called Aware Engineering in 2012. As the CEO he developed a product that improves patient adherence for prescribed CF therapy regimens and the company was accepted to the MassBio MassCONNECT program where he was introduced to leading mentors from across the industry. This experience introduced him to the abundant learning opportunities available for inquisitive health entrepreneurs. Moreover he was inspired by the personal stories of patients and their families. In just a few years Schultz immersed himself in the ecosystem and began a parallel journalism career as a Contributing Writer for publications like MedTech Boston and Bio-IT World. He served on steering committees for organizations like MassBio, the National Organization for Rare Disorders, and mentored entrepreneurs through MassChallenge. Both degree seeking UMass-Boston MBA students interested in healthcare innovation as well as non-degree seeking students are enrolled in the Healthcare Innovation course. Their projects addressed a broad range of healthcare problems. For example one project sought to improve patient recruiting for clinical trials in the pharmaceutical industry. Another is a new medical device that detects pressure sores in the bathtub for quadriplegic patients using a waterproof mat with sensors. Dr. Carlos Cappas is a Primary Care Psychologist and Quality Improvement Consultant who has devoted his work to the integration of physical health and behavioral health services in primary care offices and community health centers. He is enrolled in UMass-Boston’s MBA program in order to gain the skills needed to excel in leading healthcare organizations on improving the value and quality of care provided to vulnerable populations in a financially sustainable, yet patient-centered manner. During the class he created a consulting company called Integrated Healthcare Consultants that improves patient health outcomes and decreases overall costs for community health practices by integrating behavioral care and primary care. “It is great to see young minds with such great innovative ideas. UMASS Boston is doing it right” says one of the GEIRs Joana Veira, the Founder of Line Health. 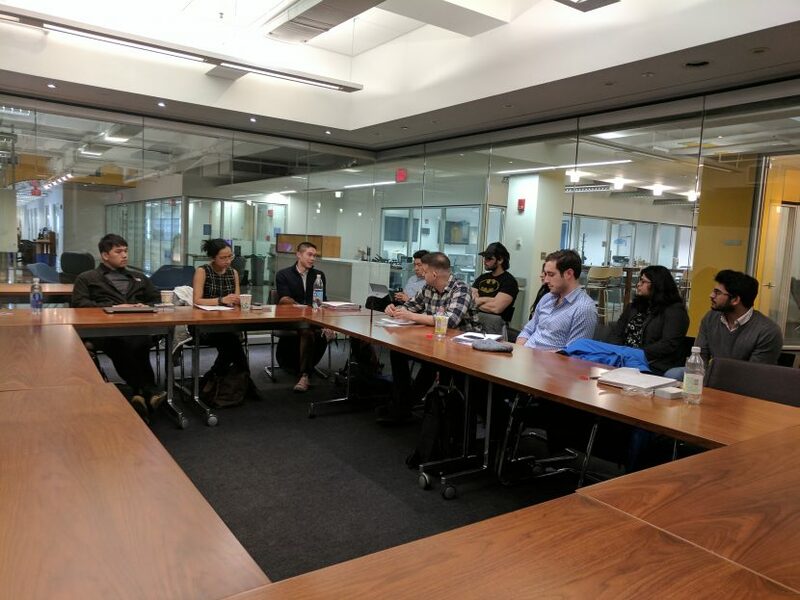 The Venture Development Center was delighted to offer its seasoned GEIRs the opportunity to help foster the next generation of health entrepreneurs and looks forward to collaborating with future Healthcare Innovation classes. The post is also available at Medtech Boston’s blog. To inquire about future Healthcare Innovation classes please contact Robert Schultz at rschultz@umb.edu.